Natural gas heaters can be a great way to heat your patio and keep the party going even as the temperature drops. However, it can be hard to shop for these great machines online. The companies that make them are happy to tell you everything that’s great about their heaters, but often leave out important details about important flaws. If you want to get a clear picture of each model’s strengths and weaknesses, you’ve come to the right place. Our reviews are designed to show you the good and the bad with each model. With that information, you should be able to find the model that’s right for you at a price that your wallet will love. 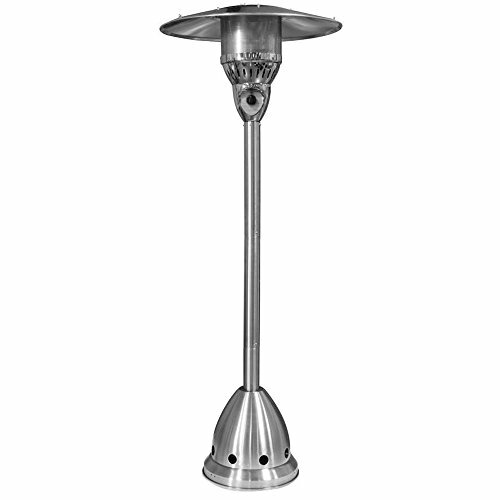 The Fire Sense 61455 natural gas patio heater is the top model on our list. It comes with an attractive stainless-steel frame. It will look good as an addition to any porch, no matter your color scheme. It also comes with great heat output, producing up to 45,000 BTUs of heat, which is enough to warm multiple people at once. It has a button to press for ignition, making it one of the easier models to ignite and run. It also includes a tip-over protection system, which keeps you safe in the case that it tips over. This model does come with a very lightweight base, which makes it easy to move around. The downside to this is that it makes it easy to accidentally tip it over unless you mount it to something. Either way, you’ll be happy it automatically shuts off if it tips over. If the base were a bit sturdier, we’d be happier with this model, but as things stand, you’re getting a great heater for the price. 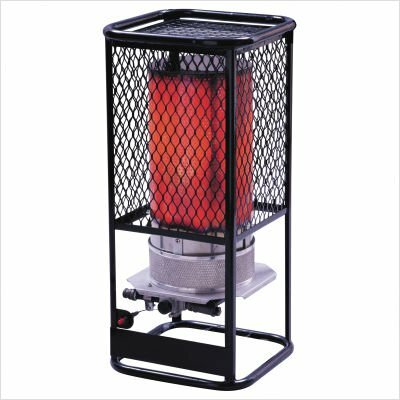 Overall, it’s the best natural gas patio heater on the market, and one most people will be very satisfied with. The AZ Patio Heaters NG-GT-BRZ is the model many people will want to get if they not only want an efficient heater but one that serves as a dramatic set piece as well. Everything about this model looks great, and while it’s in operation, a long plume of fire dances up the interior, making it interesting to look at. It comes with a one-piece glass tube, which not only looks great but increases the heat output as well. At this price point, you’re likely to find similar models, but they’ll use two smaller tubes, which don’t look as great and put out less heat. This model comes with a wheel kit, which makes it easy to reposition this model when it’s not in use, but the base is still hefty enough that you won’t worry about it accidentally falling. However, it still comes with anti-tilt safety devices. What keeps this great model out of first is the fact that it comes with horrible instructions. Many people take hours to assemble this heater, which is too much. Overall, this is a great heater, and if better instructions were provided, it could easily take first place. The Heatstar F170850 Salamander is easily the best value for the money on our list. This natural gas heater can heat up to 3000 square feet, which means you can keep a good-size backyard warm, in addition to just your patio while it’s in operation. It also puts out up to 125K BTU of heat, so you’ll never worry about being cold, no matter what the exterior temperature is. It’s also relatively small, measuring just over a foot in both length and width, and under three feet in height. Compared to some of the other models on our list, it’s unobtrusive due to its relatively small size. The one problem with this model is that the paint isn’t properly heat-treated. It sometimes bubbles and flakes, especially on the top. That doesn’t affect operation, but it does detract from aesthetics, which is something other models on this list excel at. If the manufacturer were to improve the paint, then it would be easy to rank this model a space or two higher. As is, this is a great model and one that will keep a lot of people warm at once, no matter how bad the weather gets. The Garden Sun GS4150NGSS isn’t the most expensive model on the market today, which earns it a spot on our list, even if it does come with some significant problems. You can get this for about 60 percent of what you’d end up paying for the other models on our list, so if you need a true discount solution, you might check this model out. It also produces the 41,000 BTU of heat that it promises to deliver, so it works decently once it gets going. However, the problems with this model start right out of the box. It comes with poor instructions, which makes it hard to assemble, and requires more time than it should. It also has a lightweight base, which means you’ll need to mount it to something if you don’t want it falling over. Finally, the ignition system doesn’t work very well, so you’ll find yourself spending time with a lighter getting it started most of the time. While the price isn’t bad, this can be a frustrating model to use. While frustration is hard to put a price on, it’s safe to say that most people will want a different model, despite the low price. The Fire Sense 61455 natural gas patio heater is the best overall model due to its stainless-steel frame and great heat output. The AZ Patio Heaters NG-GT-BRZ is the best-looking model, and puts out a lot of heat, though bad assembly instructions drop it to second place. The Heatstar F170850 Salamander puts out a lot of heat from a compact frame, and given its low price, it’s the best value overall on our list. The Garden Sun GS4150NGSS is inexpensive and has a good heat output, but it can be hard to assemble and hard to start. We hope that our reviews have guided you to a model that will keep you warm, no matter what the temperature may be outside. 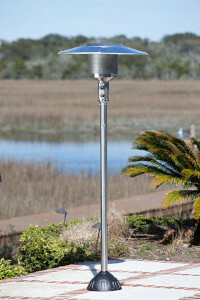 We also took a look at some of the most popular electric patio heaters on the market. The article is found here.